Hello there Doodlebugs! It's Mendi here today with an easy project focused on all of Doodlebug's yummy textured cardstocks! 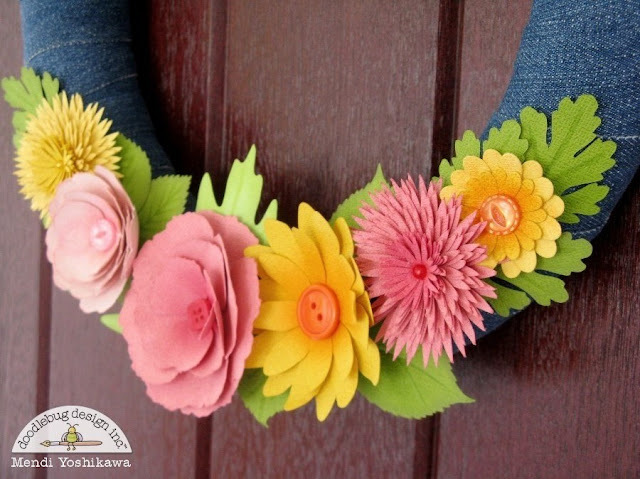 They come in so many gorgeous colors and are perfect for home decor projects like the wreath I am sharing today. 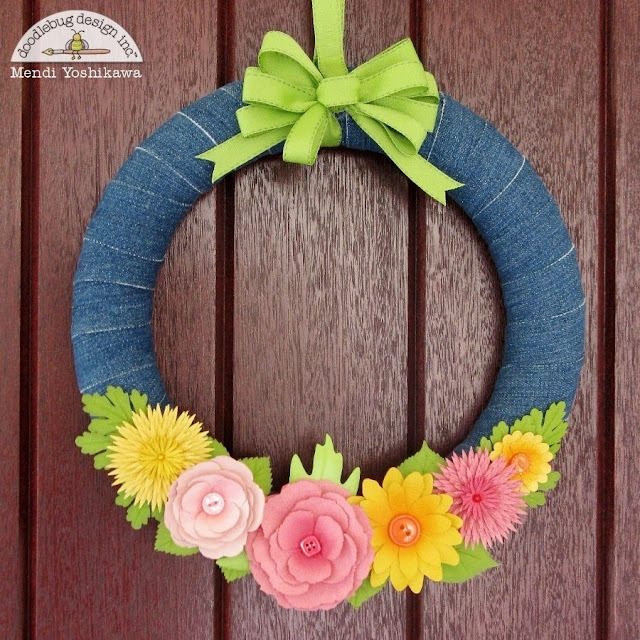 I really needed a wreath for my front door to fill in after the 4th of July holiday and carry me through September and I decided floral fit the bill. 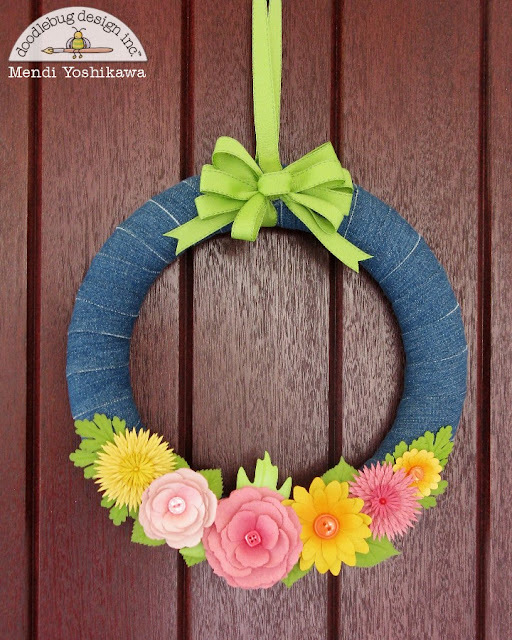 I started by covering a foam wreath form with wide denim "ribbon". I picked some up for a steal at my local Michaels and I was amazed at how quickly and easily I was able to cover the entire form. I only added some adhesive at my starting and stopping points and I had the entire thing covered in a mere 5 minutes. When doing this make sure to buy a second roll. I ended up needing just shy of two rolls so I was really thankful I went ahead and picked up two just in case. For my flowers I cut out several beautiful 3D varieties by Lori Whitlock (available HERE, HERE, HERE and HERE) which I cut out on my Silhouette machine. The dimension is so perfect for home decor items and the cardstock was a breeze to cut out using Silhouette's textured cardstock setting. I took it one step further, flipping designs when necessary and cut them out from the non-textured side of the cardstock. This helps the blade run more smoothly without getting caught on any texture and when flipped over, the cuts look very clean. In fact this trick works so well, I even try to do this with patterned paper to avoid those little white corners on the front of my cuts. I must confess even though Lori has some wonderful video tutorials on how to assemble these (seen HERE), I was having trouble getting my flowers to look as pretty as her samples at the Silhouette store. To cover up my handicap, I added Doodlebug buttons and pearls to the center of my flowers after spritzing on some ink in the centers. I finished off my wreath with a matching bow. This is so lovely and sweet Mendi, just like you!!! Love your work!!! The links to the flowers didn't work. Is that a problem with Silhouette website? Oh wow!! Mendi that is just gorgeous! Those flowers are so amazing!! You are crazy talented!!! Love this Mendi ... cute project! Mendi totally rocked this project!!! So gorgeous, so lifelike and just such a pretty and amazing thing to put on your door!!! I am WOWED!!! 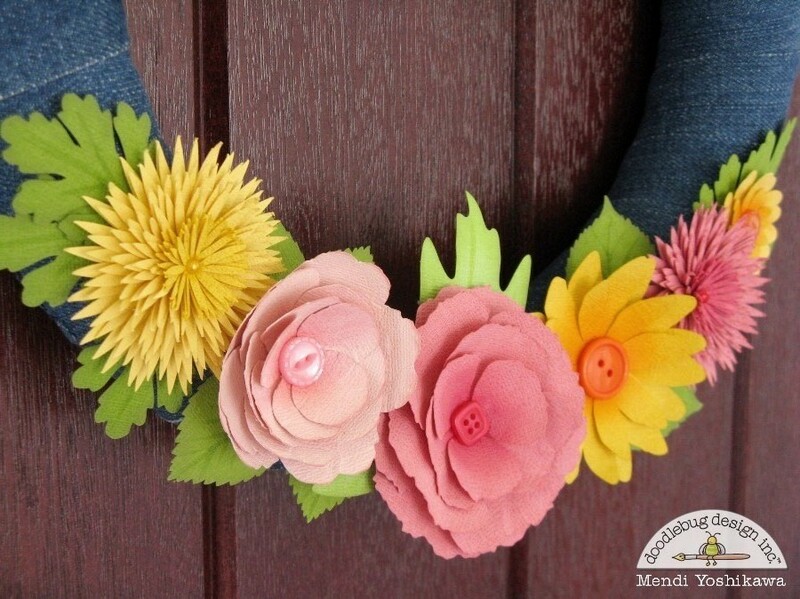 Mendi, I could have sworn I commented on your gorgeous wreath already. This so pretty, the flowers look so life like and I love the delicate flowers with the denim backdrop.